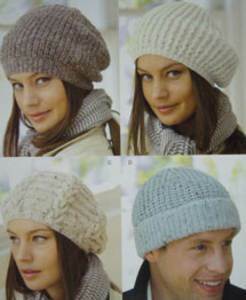 Cable beret: 4-9yrs 50g, 7yrs to woman 100g. Twisted st beret (top right): 4-12yrs 50g, woman 100g. Based on 50g balls mixed fibre DK. 22st/ 28 rows to 10cm, 4mm needles. 3.25mm and 4mm needles, cable needle for cable beret.